dashing out the door for kids sporting events. 2. In large skillet, cook ground beef and onion; drain. 3. Stir in spaghetti sauce, Italian seasoning . 6. spread a third of the meat sauce. 7. 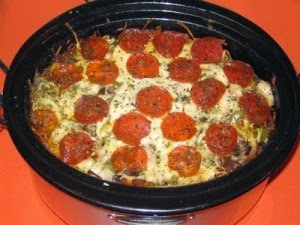 Cover with a third of the noodles and pepperoni. 8. Sprinkle with a third of the cheeses. until heated through and cheese is melted.